Hawaii defensive lineman Amani Purcell knows New Mexico State's offense is similar to the Warriors in its pass-first philosophy but is wary of the Aggies adding new wrinkles. Undefeated and 16th-ranked Hawaii is a 27-point favorite against a 4-4 New Mexico State team that mirrors the Warriors in offensive concept and propensity for passing. The simple conclusion is that the UH defense can just rely on the muscle memory of practicing against its own offense since August and not worry about what the Aggies might bring to Aloha Stadium on Saturday. Simple, yes. But also dangerous. 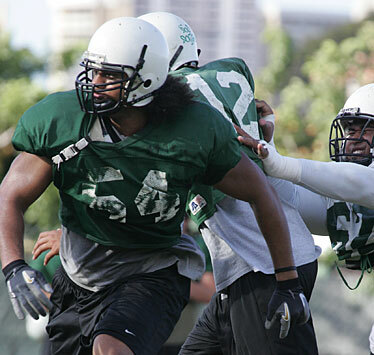 "We've got to be careful," UH defensive end Amani Purcell said. "We don't want to think it's just like our offense and then they come out with a surprise." It's pretty much a given the Warriors will score points (they lead the nation with 52.1 per game). For Hawaii to go to 8-0 and tie the program's best start, the defense will need to contribute some big plays, too -- as it did in the first seven wins. "We do our own thing; they pass a lot but that's not the only thing they do," defensive end Francis Maka said. "They like to establish a good run game early on. Either way, we just gotta do what we do." Defensive end David Veikune has five sacks this year after getting only two last year. You won't see the word "START" at all next to the name David Veikune on the Hawaii football participation chart. But the junior defensive end has certainly done a good job of finishing. Veikune leads the Warriors with five sacks. As a team, UH is seventh in the nation at getting to the quarterback with 3.57 dumps per game. "I just go out every play and go as hard as I can," said Veikune, who is ninth among the Warriors with 21 tackles this fall. "I'm lucky to get those sacks. Most of them are coverage sacks." Like tackle Keala Watson, linebacker Blaze Soares and cornerback Ryan Mouton, Veikune is not with the first 11 to open the game on defense. But all are considered starters by defensive coordinator Greg McMackin. "David Veikune is one of our best defensive players. If we played him every down, he'd have 10 sacks. But he's a team player and it helps us in the long run," McMackin said. "The thing about David, he's a relentless player. When they run screens, when the quarterback throws the ball, he'll get out there and make the tackle. He's a relentless pass rusher. He won't give up. Just keeps going." The Warriors will need Veikune's motor Saturday against New Mexico State. The Aggies try to wear down defenses with a no-huddle offense and passing attack that extends the length of games. Combined with the Warriors' quick-strike offense, both defenses will be doing a lot of running. "It's going to be a tough game," Veikune said. "They run that 2-minute O, just going, going, going. Plus, always passing down the field. Probably the most conditioning we'll need in a game. Last year we had a lot of injuries from the game before and I got a lot of playing time. I know this O-line a little bit, and the QB (Chase Holbrook), he's nicked up a bit." After Veikune, Amani Purcell and Karl Noa, Francis Maka and John Fonoti add depth to the end positions. Purcell hopes to make a big play like the one his now-graduated brother, Mel, made in last year's game that turned the momentum around. Purcell's crushing fourth-quarter sack of Holbrook caused a fumble that Adam Leonard scooped and scored with in UH's 49-30 win at Las Cruces, N.M.
"Yesterday I was talking to Mike (defensive tackle Lafaele) and saying I should wear (Mel's) number 98, so when the guy sees me, he'll say, 'Oh, no, he's back again,' " Purcell said. "I need to get me a (big hit) this week." The Las Cruces Sun-News reported yesterday that Aggies receiver Chris Williams is likely out for the rest of the regular season with a broken collarbone. "He should be back in six weeks, there's an outside chance he could play against Fresno. Obviously, he should play in a bowl game," Aggies coach Hal Mumme said. Williams led the nation in several receiving categories last year, and was pacing NMSU this fall with 56 catches for 772 yards, 11 touchdowns and a 13.8 yards-per-catch average. He's also a top return threat. Senior Kenneth Buckley replaced Williams with six catches for 84 yards and two touchdowns in last week's 45-31 win against Idaho. Starters Jake Patek and Keao Monteilh were OK, but the Warriors depth at safety was stretched thin yesterday. Desmond Thomas was still out after tweaking a hamstring Monday and Dane Kealoha Porlas was banged up, too, putting both No. 2s out of commission. 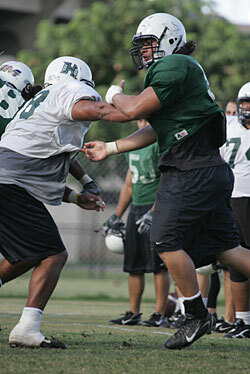 Another backup, Viliami Nauahi, was in a boot to protect a sprained ankle suffered in last week's Scout Bowl. "I had to take Dane off the field," McMackin said. "He strained his knee in special teams but didn't want to come off. He'll be fine tomorrow. "(Thomas) will be ready to go. I'm not worried about it." Head coach June Jones and McMackin both said the injuries gave two other players an opportunity to get some reps with the regulars. "It gives us a chance to look at Erik Robinson, and Spencer Smith has been doing some good things, too. We got some looks at them and let the other guys rest." Meanwhile, cornerback Ryan Mouton did not practice. Guyton Galdeira was in on nickel packages. Jones said if Mouton can practice today, he can play Saturday. "Even if it's limited, it would be good for him to get the feel of it," Jones said. Meanwhile, backup receiver Greg Salas was out a second day in a row with sore ribs.